The red socks that I originally planned to knit for my Project Spectrum project are finished. I had to give up on Project Spectrum this year as life got in the way. I hope that there will be another round next year as I really enjoy it. 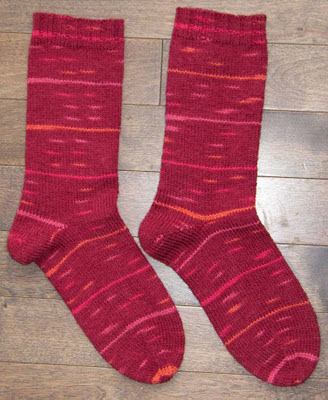 It's good to have these socks completed. I gave them to my daughter who likes them a lot. Very pretty and perfectly in time for the holiday season!